Set make up and brand recommendations from major manufacturers like Srixon, Cleveland Golf and Mizuno. Once you are fit properly, you can purchase your equipment from the company of your choice. Purchase Srixon & Cleveland Golf equipment directly through Grexa Golf and only pay $30 for your fitting! TOP 10 REASONS WHY CUSTOM CLUB FITTING WILL HELP YOUR GOLF GAME AND LOWER YOUR SCORES! 1. There are three ways to improve your golf: a) Practice b) Lessons c) Custom fit golf equipment. 2. Dynamically fit drivers, irons, wedges and proper set make-up will consistently lower scores by improving ball striking and ball flight tendencies. 3. Custom Fitting allows a player to maintain proper development of golf swing fundamentals and will increase pace of improvement, by helping to produce better shots while building trust and confidence in ball striking. 4. Custom Fitting will advance the shot making and shot shaping capabilities of a player, increasing the frequency of better shots performed during a round. 5. A Custom Fit club eliminates the need for swing compensations due to improperly fit equipment which result in poor swing mechanics. 6. Custom Fitting can aid a player with physical conditions, such as sore ligaments, ailing back, artificial hips / knees, which as a result can provide increased time spent practicing and / or playing on the golf course. 7. Custom Fitting will increase precision and accuracy, as well as, distance and ball flight control, required for improved shot making and lower scores. 8. Custom Fitting will optimize the launch conditions of a golf ball in flight, which is necessary to maximize carry distance and increase control. 9. Custom Fitting will eliminate yardage gaps and identify sole performance variables required to strengthen short game for improved scoring ability and lower scores. 10. Custom Fitting for set make-up will furnish the player with the best 14 clubs and will promote proper club selection for ideal course management. 1. Shaft technology has improved dramatically. 2. Shaft flex and shaft kick point will determine your ball flight tendencies. 3. A brand named golf shaft, such as Steel Fiber or Matrix, will offer optimal performance and consistency. 4. Graphite shafts offer a variety of different weight options. 5. Check with your local PGA Professional and Club Fitting Specialist to get the best fit. Golf Grips – Why your golf grips are so important. 1. The golf grip connects you with the club. 2. The size of your hands will help determine the size of your grip. 3. Your sensation of feel will determine the grip texture & size you will choose. 4. There are many styles of grips – choose a style you are comfortable with. 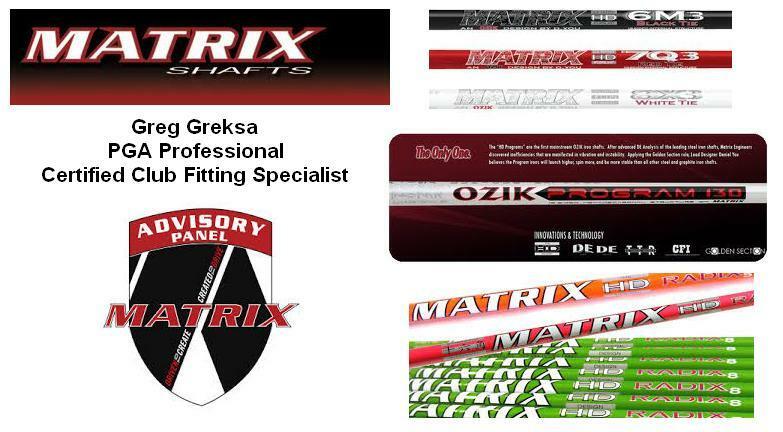 Greg and GREXAGOLF uses Golf Pride Grips!